« Happy Belated Dumpling Day!! Seaweed has always been my favourite. I can eat the entire pack, yes few hundreds slices all at one go. My favourite soup is also seaweed soup, the real seaweed kind. In Cantonese, it is called “Kuan Po Hoi Choe”, you can ask the Chinese medical shop. I don’t know about you, but eating seaweed has made my hair black. I seldom get white hair and no need to dye. I never dye my hair too because I cannot stand the smell of the chemical. 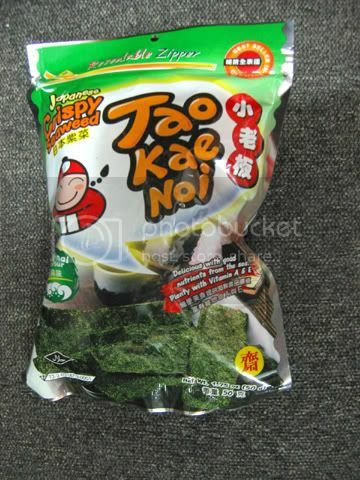 Now in the market, brand new Japanese Crispy Seaweed, made in Thailand. Yes Crispy. It is very nice but only thing is, they put a little bit too much salt. It is not very healthy for children. Anyway snacks are never healthy. If you haven’t tried it, go get it from Tesco. Most of these sea weed very salty.. I wanted to let Zara try but just afraid of the amount of salt.. *sigh*. Really, eating seaweed can make hair black? True or not? Aiyo, I hate the smell wor. But for the sake of black hair, I guess I’ve to try and swallow. I’ve lots of white hair sprouting out now. Maybe I’ll try the crispy ones – sounds more delicious. I like to eat those paper thin seaweed too but its salty like you said. i got a pack of similiar wan from Cosway, yah, a bit too salty for kids, but got sesame inside, so I mix it with porridge for the girl, I tell you, it was… yummy :D, in the end three of us finished one pack with big bowl of porridge. Egghead: Too much salt is not good for you. Zara’s mama: There are saltless seaweed. I heard from my friend, you can get those from organic shops. Tracy: Hahaha, not sure whether that is a myth but no harm trying. Mumsgather, Jess: Get those without salt. Maria: I love porridge with “oil fried ghost” (a.k.a. “yau char kwai”). I have lots of white hairs! Ok, must eat seaweed everyday now!